I used to dread the forecast with snow in it. Mainly getting out and shoveling (I'm not a young kid anymore), and bad drivers. But now looking on the brighter side.... errr...the photography side of it, snow makes for some beautiful photo ops. The other night it snowed for a few hours , and I woke up to a winter wonderland. No way could I stay cooped up in the house. I grabbed my gear, and headed out. This is one of the first pics I snapped that day. Normally when I step outside, without the snow, I wouldn't even give these same houses a second glance. However, snow, and the way the sun was reflectiing off it yielded some interesting images. 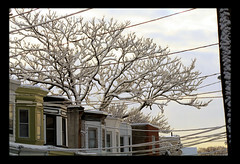 Please be sure to click on the image to see this in a larger size, and for other snow related images I shot that day.